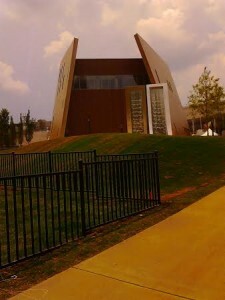 (APN) ATLANTA — Earlier this week, Atlanta’s new National Civil and Human Rights Museum opened to the public. The museum is located at 100 Ivan Allen Jr., Boulevard, between the World of Coca-Cola museum and the Georgia Aquarium. The land was donated by Coca-Cola. The museum cost 80 million dollars to build, relying to a great extent on corporate donors. The Center was the brainchild of civil rights activist, Evelyn Lowery and United Nations Ambassador Andrew Young ten years ago. The 42,000 square foot museum links the 1960’s civil rights movement with human rights struggles around the world today. The visitor will find, under a protective glass case, a collection of King’s personal letters, speeches, notes, documents, and books loaned to the museum from Morehouse College, King’s alma mater. Some of the documents are in King’s handwriting and also on display are some of his personal items. The materials on display will rotate three times per year, so different items will be featured. Former Atlanta Mayor Shirley Franklin is the main person responsible for saving King’s personal papers from going to the highest bidder at a Sotheby’s auction in New York back in 2006. Mayor Franklin called on the Atlanta business community and prominent citizens to secure the money to purchase the collection for 32 million dollars. “It had been discussed on and off for several years. Evelyn Lowery was the first person to mention it to me in 2002 and shortly after that, Andrew Young came and mentioned the same thing,” Franklin said. “As a result of that, as I was planning and developing my strategic plan for initiatives that I would undertake as Mayor, this was added as a result of their keen interest in the topic – in building an institution. It was one of a number of things that was suggested at the time,” Franklin said. “As we were developing our Economic Development Plan, what was called the Atlanta Development Authority (ADA, today doing business as “Invest Atlanta”), this became one of the ideas that was discussed from time to time,” Franklin said. “A.J. Robinson (President of Central Atlanta Progress) came forward and started working with Greg Giornelli (now-former Chief Operating Officer of the City of Atlanta and former President of the ADA) and Peggy McCormick (now-former President of the ADA) and folks at the Development Authority and we did an initial feasibly study,” Franklin said. “When you looked at all the museums around the country, the Atlanta story was not being told. The intersection between Atlanta and the Civil Rights Movement was not being told, other than through anecdotes and oral histories,” Franklin said. “Shortly after that, we recruited Doug Shipman and we formed a board… From 2002 to 2003 it was in the formative stages, so it wasn’t until 2005 that we became more than a concept,” Franklin said. “It is designed to keep the interests of people and to help them understand the power of conviction, passion, and strategy. I have the expectation that young and old will be moved to act,” Franklin said. “It gives you the opportunity to learn more about the people who ignited these changes. I have reason to believe that lots of people might see themselves in an active role on the issues they care about,” Franklin said. At the Pettus Bridge exhibit, APN ran into “General” Larry Platt, who showed me a picture of himself in the march on Pettus Bridge in 1965. “I’m here today, because I marched at Pettus Bridge on Bloody Sunday. I was one of the foot soldiers with John Lewis and Hosea Williams,” Platt told APN. In another area, you can view a series of painting that depicts his life story of U.S. Rep. John Lewis (D-GA). 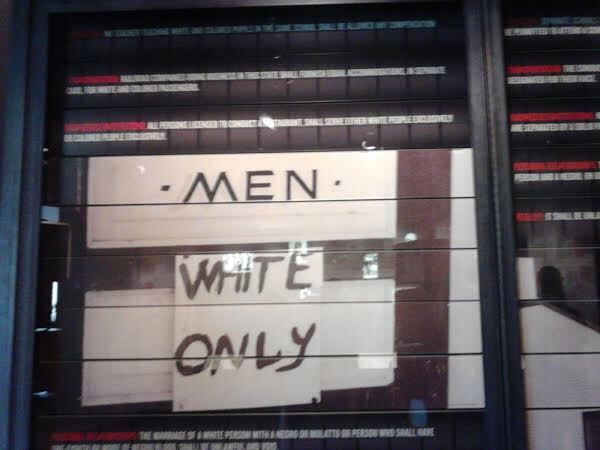 When you walk through the entrance, you are transported back in time when segregation and Jim Crow laws were the norm. If you look up, you will see pictures of Black men hanging from trees. A wall of infamous segregationists like George Wallace, Strom Thurmond, Lester Maddox, and others introduce you to the segregated and unequal world of Blacks and Whites of the early fifties and sixties in the U.S. South. “White Only” and “Colored Only” signs publicly displayed tell Blacks where they can and cannot eat, use a restroom, or even drink water. Consciousness slowly began to change with the 1954 Supreme Court case, Brown v. Board of Education, that opened segregated college doors to Black students. On the walls of the museum, visitors can read the history of the Montgomery Bus Boycott; the integration of Central High School in Little Rock, Arkansas; and other important resistance movements that started to happen across the South. Visitors learn the history of Black and White Freedom Riders who rode together through the South protesting segregation. An accompanying interactive audio is available to hear individual Freedom Riders talk about their experience. 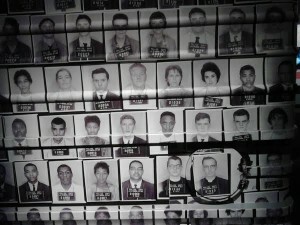 Hundreds of mug shots of Freedom Riders form the outline of a bus. A student sit-in at the Woolworth’s lunch counter is reproduced with interactive headphones to experience a racist threat to “punch your eyes out with a fork” while others threaten to kill you for simply sitting in a “Whites only” restaurant and trying to order food. The students were trained to non-violently sit and patiently wait to be served, while Whites often hit, kicked, and threw food at them. The next exhibit is the historic 1963 March on Washington DC. You can sit and listen to videos of civil rights leaders speaking to the crowd about demands for legal rights, equal rights, and political change. Dr. Martin Luther King, Jr.’s “I Have A Dream Speech” plays aloud. Biographies of prominent people in the civil right movement are on display. Reading about John Lewis, Stokely Carmichael, Julian Bond, Rosa Parks, Fannie Lou Hammer, and dozens of other political transformers could easily take one an entire day. The last exhibit is television and radio coverage of King’s assassination and the national reaction to his death. The third floor gallery contains “Spark of Conviction: The Global Human Rights Movement.” It begins with the United Nations document, the Universal Declaration of Human Rights, adopted in 1948. You learn about different human rights movements that have taken place all over the world from World War II era to the present. An interactive mirror room features different countries, issues, people and their struggle for freedom. You touch the person or issue in the mirror and it tells you their story. Some of the human rights issues explored are immigration, disability rights and voter rights in the United States, women rights in Iran, HIV/AIDS issues in China, and LGBT Rights in Russia. International human rights activists like Nelson Mandela and Mahatma Gandhi are featured. A line up of past and current dictators is also on display. This gallery will feature updated content on a regular basis. The Center for Civil and Human Rights is open seven days a week. Hours of operation are 10 am to 5 pm. Ticket prices range from fifteen dollars, to five dollars for children under 2, and active military free. The Center’s founding sponsors are Coca-Cola and Invest Atlanta. Corporate sponsors who have given one million or more are AT&T, Bank of America, Delta Airlines, Siemens, Home Depot, SunTrust, Turner, and Wells Fargo.